The SL-1210M5G Grand Master Direct Drive Turntable offers even more features then the standard-setting SL-1200MK2 or the newly introduced SL-1200MK5. Technologically advanced tonearm modifications virtually eliminate skipping making it awesome for scratching, and now you can customize braking speeds to suit your applications. Another great feature of the SL-1210M5G is the zero pitch Quartz-Lock button and expanded pitch range options: Â±8% or Â±16% via computerized pitch control, with blue LED numbers indicating the amount of pitch adjustment currently applied. A second button next to the pitch reset button allows switching between the two levels of pitch adjustment. I previously owned a Raga Planer 2 for many years and elected to go with a low output moving coil cartridge (Benz Micro) and whilst the sound was good it also showed that the Rega ran slow, so I opted to upgrade. My HiFi buddies are belt drive types and they made recommendations to clearaudio, project Marantz etc but I looked and listened but was never really impressed - it was going to be more of the same with the Rega. I googled turntables and thought about direct drive, which my buddies warned me against, but after reading a few reviews on line of the SL1200 Mk2, I thought what better than a Mk5G as it had upgrades to the tonearm wiring, tonearm titanium coating, fancy paint job etc, so I started looking out for one. I eventually found one of the last two available in New Zealand and I bought it. Since then I have added the KAB 5mm super thick mat (to get better VTA adjustment for the Benz Micro and Denon DL103 cartridges) a KAB tonearm damper, a Mitchel engineering record clamp and a Sumiko headshell. My turntable never fails to impress and the music reproduction is excellent. Bass slam - bass as it was intended to be and mid's and highs going to levels never experianced with the Rega. My HiFi buddies dont like it but I think they are jealous, so all in all, the best turntable I could think of and one that I will keep forever. Get over the DJ turntable listing, as this turntable fitted with a decent cartridge MM or MC will provide musical entertainment for you to enjoy. A note to all Mk5G users and even 1200 Mk2 users, the KAB tonearm damper is a really good upgrade. Easy to fit and set up and the detail that you will get is just a sensation. I’ve spent a few years with the Technics 1210MK5G turntable and I thought I’d add my 2 cents and share some of my observations about it with you and not rehash what’s already been said. I’m 48 years old, certainly not a kid and not a DJ. I’m an audiophile and I like high end equipment because of its ability to create an emotional experience with recorded music. When I bought the “Grandmaster”, I really wasn’t sure about getting back into vinyl. I had 3 records at the time of purchase. About 25 years ago I gave away my small collection of records and Dual turntable to my brother-in-law because it was widely acclaimed that CD killed vinyl. I had a crappy receiver system anyway so no snap crackle pop sounded like a huge improvement but in retrospect, giving my stuff away a really stupid move on my part. After doing some research on various tables and not looking to spend a lot of money, I settled on the 1210M5G for exactly $458 new. Add cartridge, cables, record weight, and phono amp and I was in for $2,300, still very modest bucks in the uberbtuck audiophile world of equipment. Fast forward four years and I’m up to about 500 vinyl records and growing so the Technics served its purpose. So here’s my review and where I’m at with the Technics Grandmaster. This is a well engineered turntable designed for a specific application. Don’t kid yourself, it’s a bona-fide DJ table. At 26.5 lbs, it’s designed to be light enough to be transported from gig to gig and the build quality facilitates a high degree of reliability in that respect. Is it built like a tank? Please, go check out an Avid and you tell me. Aesthetically, the looks are pedestrian. We have a stamped metal top, metal flake paint, and a plastic tush, and some pseduo-neumatic feet. For me, it doesn’t have that big boy toy look, but again, this table was a compromise compared to what was available at the time. KAB USA makes or markets some wrap around wood dressing (cabinet) for the 1200’s for about $250. I lucked out and found a guy selling a maple one on ebay so I bought it for $135 because it matched my speakers. That did wonders for dressing up (hiding) the table so now it has more of a mid-fi vintage look. Speed accuracy is just dandy. It’s a beat machine and dj’s count beats so the accuracy for the price is outstanding. Although Technics has taken some measures to dampen the platter, trust me get the ¼”. thick mat and maybe a 300 gram record weight in tandem with possibly another thin felt mat. I ended up even adding some visco-elastic material to the underside center of the platter and that seemed to help quiet the platter down some more. All in all, really, a great entry level turntable as far as making music is concerned. Now, within the last two years the price of this table has doubled, in some cases, a bit more than that. Conversely, high end table manufacturers have been releasing all sorts of new tables at lower prices. For me, this is the perfect time to upgrade tables into something a little more esoteric. If you’re looking to get into vinyl again, looking for a table for a summer home system, etc., yes by all means check out the 1210MK5G. But considering the price increase, check out Funk Firm, Rega, VPI, and a host of others before you make your decision. 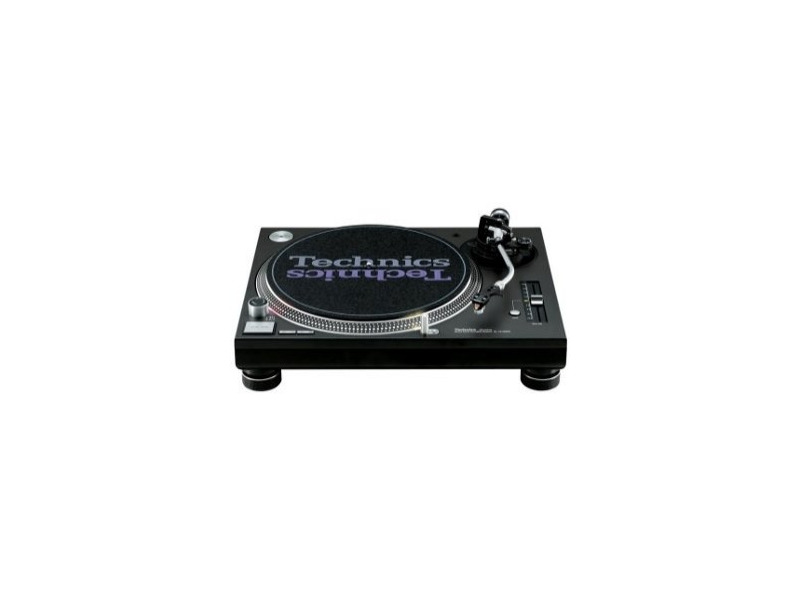 I think there’s a lot more competition out there and if Technics wants more of that audiophile enthusiast revenue, they really need to up their game and manufacture a table that is as well engineered for us as the 1210MK5G is for DJ’s. Super quiet black "void of space" background. Gimbaled tonearm, and I like the retro look. High quality tonearm cable on this model. The slider is a cool feature if you like to change the pitch or review a passage at slower speed. Swapping cartridges is a snap with multiple headshells and accurate markings. Would like to see subequent versions allow for greater flexibility and ease in swapping tone arm cables, tonearms, updating power supplies, and the like. Not that you can't do it now, but it takes more effort and knowhow. It's my opinion that 1210MV5MG and its predecessors may be favored by dj's around the world, but this particular version is a serious piece of audiophile gear. There's plenty of information on the web and specs, so I'm not going to focus on that, but I do have quite a few impressions of this refined beast. I dare say it appears to me to one of the most technologically advanced turntables in the world that is within the reach of the average consumer. The motor and platter assembly are absolutely incredible. I don't know if this is accurate, but it looks to me that the motor and the platter are magnetically coupled, meaning the motor has no physical connection that I could see to the platter. If that's the case, that would put this table in same leage as air drive systems. Hopefully other reviewers can shed some more light on how the drive system works. It's also a very ergonomic and user friendly machine. Now I know lots of people love to fuss with their TT's, make adjustments, make it a somewhat of a ceremony to play a record, that's cool with me. I have no issues with people deriving enjoyment from spending their money and playing with their gear. But I have to say, this turntable is blast to use. You're up in under 1 second and the speed is dead on. I'm even having fun playing with the slider and reviewing some passages at slower speeds. Back to perfect speed at the touch of the reset button and you don't have to account for stylus drag. Hell, you can brush the record while it's playing. The rubber mat is outstanding with a slight depression for the underside of thr record label. I'm using a lighter stainless steel Clearaudio clamp and set-up was also achieved with a Clearaudio aluminum protractor jobber thingee. The integrated lighting is a welcome feature. A red LED hitting the strobe mirrors is neat, but the blue pop-up LED that lights up the stylus is straight out of James Bond! Impeccably cool! There's a lot of great tables out there, but I just couldn't pass this one up given it's most critical attribute: THE SOUND! Forget about price for a moment and ponder that to these old ears, the presentation in terms of soundstage, speed, decay, ambience, and the void of space where sounds emerge from this machine provides is anything but entry level. I hope you'll agree and get one before folks here in the USA realize what they've been missing. Tyler Acoustics Linbrook Signature Monitors/Custom Stands (Slamming Audiophile Value), Check out Polk LSi9's if you want a taste of the action on a budget - I wouldn't part with mine. Parasound A21 amplifier, Audioquest King Cobra interconnects, 2 Tascam Decks, Parasound Line Drive Preamplifier, 12 amp Oneac Power Conditioner, 2 Furman Rack Strips, Cambridge Audio Azur 640C CD, Ractopirates 21 Space Rack, PS Audio Extreme Plus Speaker Wires, KnuConcepts silver plated copper wire and Monster Bannanas for jumpers, Maple speaker bases and turntable base from mapleshade.com, Auralex platforms, Earthquake sub, Carver TX11a Tuner, WooAudio 3 Tube Headphone Amp (Awesome), Sennheiser HD650 phones. I know, it's a measly low fi system to some of you out there, but hey, it's only my office system. I'm buying a 1962 Red Convertible XKE Jag with the money I saved and I'll be getting more chicks to look at me with that than a megabuck system. So there! I sold my last turntable two years ago. That was an original Ariston RD11 with SME 3009-II. I ended up wasting loads of money buying music I already in my archived vinyl collection on CD. My options for a new turntable were limited to the rather fragile audiophile models or a DJ deck. My Ariston sounded ok when it was set up correctly and it got through parts. It took ages to start up, the speed change was under the platter. The springs, belts and wood made it feel a little agricultural. More often thant not, it was feeling a bit off colour. What I really wanted was something that was built to last and convenient to use. Enter the MDF-free Tehcnics SL-1210M5G. The deck has been around for 30 years or so and needs no introduction. The M5G is a 30 year celebration model and has a special finish as well as some addtional DJ features, it looks stunning. Sound quality comes second to durablility in DJ deck design, and this model is no exception. Audiophiles usually steer clear of direct-drive turntables for obvious reasons but it actually sounds fine for home use. I added a Rega Bias 2 cartridge and it sounds as good as any other deck I've owned including the RD11 and a Rega 3. SL1200s have always been fast and fun to use. Long term running costs are cheap thanks to the abundance of spares and durable construction. Without doubt, the best record deck I've owned, a real classic! Best overall turntable in the world.Best table for scratching. Torque is always strong and a solid feel. Minus the fact I dont have gold plated, this is a beautiful looking and impressive piece of equipment. Expensive turntable for someone that just wants to play records. These turntables are built for one purpose: Best DJ turntable made. Ask any dj that has had the chance to use and master the art of mixing, scratching and functionality of a turntable and this is it. I have been mixing for 25 years and have played in many clubs but always call the 1200's my home tables. I recently came across a great deal and bought the latest 1210 M5G. I had waited about 4 months online looking for a great deal and found them for $450 each. Keep in mind I paid almost the same price for 1200 MK2 15 years ago. Took not more than a few sessions of mixing to get used to the digital pitch slider (user replaceable). I have been so familiar with the dead spot just under +-0 (any dj that uses 12's knows about this) that it was a change to have to look where zero is instead of feeling it. I never felt the need to have more than +-8% mixing vinyl until I bought the M5G's. Just add one more tool to your creativity list! The anti skating has been increased and the all black finish is a dream to look at as is the blue led lights and pitch. The pitch control feels a bit less solid than the sliders on MK2-5's but in a different way. I have been using my M5G's now for about 9 months and pitch is perfect with both tables. Still feel brand new opposed to non digital 12's that get that broken in feeling after significant use. This is a Ferrari workhorse. Beautiful to look at and solid as a rock strong. My old 12's have been with me for 15 years and I still love playing on them when the need for 1 or 2 more tables are in order. I have tried just about everything on the market including: American DJ, Newmark, Vestax, Denon, Stanton and Gemini with a few that come close but the test of time sends me back to Technics every time.